"Murzuq 06 - Desert Heroes Remembered"
Long Range Desert Group's adventurous 1941 raid. A celebratory re-run of the Long Range Desert Group's expedition to Murzuq, Libya, has now been completed. The original expedition was accomplished by the newly formed LRDG in 1941. The dune-encircled oasis of Murzuq was, in 1941, a heavily armed supply base for Mussolini's forces. Situated in the middle of Libyan Fezzan, it was considered a safe haven, protected from attack by it’s natural desert defences. Targeting this remote site, two LRDG patrols set off on a secret sortie across the Libyan Sand Sea in late 1940, complete with all supplies for their raid. They were commanded by Major Pat Clayton, a renowned mapper from Egypt, and Captain Michael Crichton-Stuart, Scots Guards. They crossed over 1,200 miles of open desert, took Murzuq by complete surprise, destroyed the ammunition dump, blew up the bomb depot and demobilised the aeroplanes. The raid was an outstanding success. It was widely hailed for its audacity and daring, and has captured the imagination of desert travellers ever since. Kit Constable-Maxwell, FRGS, group coordinator, ex Scots Guards, traveller, photographer. A veteran of extensive desert travels in North Africa, Saudi Arabia, Afghanistan, India, Nepal, Tibet, China. 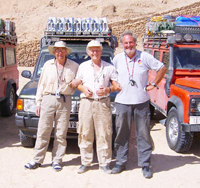 Dr Raymond Bird, FRGS, navigator, ex RAF, widely experienced in deserts hot and cold, including Pamirs, Afghan, Sinkiang, Oman, Egypt, Libya, USA, Chile, Namibia and most other parts of the world. Richard Noble, OBE, an experienced desert traveller and well known for his unparalleled achievement in gaining and holding the world Land Speed Record in his cars,'Thrust 2' and'Thrust SSC'. Our group also included Nick Robinson, Crispin Clay and Simon Montford who were each an essential part of the team, together with Mamadu, our Touareg guide and Hassan, our resident 'gendarme'. Via Tobruk to Big Cairn, then following LRDG's route westwards to Murzuq. The terrain varied from steep dunes to rock-strewn plains. We drove down dune corridors in the Kalansho Sand Sea, crossing the range at dune gaps to maintain heading. Our longest leg between supplies was almost 1,000 km. We carried all fuel, rations and water supplies with us. 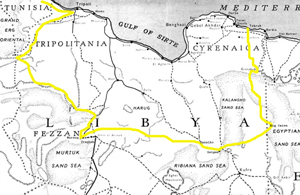 Libyan Expedition - honouring the Long Range Desert Group. We are off to Libya at last. Raymond Bird and Kit Constable Maxwell are in a well-loaded Land Rover Discovery. We had a 10 hour drive to Aix en Provence where we met up with two Land Rover Defenders. Richard Noble and Nick Robinson are in one. Crispin Clay and Simon Montford are in the other. Richard's brother, Andrew, came to bid us farewell and brought us a case of wine for the journey. We arrived at Marseille and board ship for the 22 hour crossing to Tunis. Comfortable berths and good ship. We assembled at tea time for a drivers briefing. Kit explained the intricacies of dune driving, Raymond explained the route and the itinerary, and Nick briefed us on first aid. Arrived in Tunis and docked at 11 o'clock to be greeted by shouts, waves, officialdom, beaurocracy, gendarmes and douanes all giving conflicting instructions. Self-appointed fixers argued amongst themselves and gesticulated wildly. Welcome to North Africa! Richard was directed into the 'residents' channel and had his walkie-talkie impounded. Very irritating and time consuming, but not serious as we got them back later. We left the dock 2 hours late and drove the length of Tunisia. In the small southern villages Chilli beans were hung out to dry - a colourful red adornment to the simple white buildings. We arrived at Matmata which has been home to Troglodite communities for centuries. We booked into the Troglodite Hotel El Barbar and were shown to a cave - albeit one with white marble floors and four poster beds. We cleared Tunisia customs in record time (about 2 hours) and Richard recovered his walkie-talkie set. We entered no-man's-land and were greeted by a tall welcoming Touareg with a broad smile, clutching our Visas. We fitted our new Libyan number plates and set off for Sabratha. We reached the historic Roman ruins and set up camp by the car park. Many camping skills were learnt here, new equipment unleashed from factory wrappings, and everything was going well when we were hit by a sudden rain squall. We all got wet and it was an honourable christening. Sabratha ruins revealed unrivalled craftsmanship and we walked down paved streets 2,000 years old, examining temples, forums, squares and a splendid theatre. The site borders the sea and the waves lapped gently. We drove on to Tripoli, passing the pretty harbour and continued to Leptis Magna. The size and scale of this important Roman site is amazing, as is the quality of stone and marble carved into decorative features, capitals and plinths. More on this later. We camped for the night under sun-baked palms. We drive all day and camped at Ben Jawad on the Mediterranean sea-shore. Very nice camp site, but windy and too rough to swim. Long driving day. We woke at 6 o'clock and left camp at 8 o'clock. We are now in a flat barren desert inhabited by the occasional family of camels. We reached El Adem finally (I was last here in 1959... and it hasn't change as much as I have!) and camped in a welcoming desert wadi. Drove to Tobruk. A nice harbour, sparkling in the morning sun. We visited the German War memorial, a very fine fort built on a high bluff. Then we left for the long drive to Jagbub where we topped up all fuel and water containers. We were now heavily laden, I was carrying 300 litres of fuel and a hundred litres of water. We turned off into the desert and found an old abandoned piste. We had to climb a sandy ridge to gain the plateau, and we all got stuck at different places. Sand ladders were used for the first time and we were soon free. At dusk we descended into a picturesque valley, located by our Touareg guide Mamdu, with soft sandy patches and eroded rocky outcrops for windbreak. Perfect for camping and here we spent the night. We viewed a memorable desert storm with a bright red halo rising over the dunes. After breakfasting on pâté, jam and crispbread, we drive out of our camping valley and rattle off across the stony plateau. Soon the terrain turns increasingly sandy and we started negotiating dunes and soft sand. Now we are deep into the boundless reaches of the Kalansho Sand Sea - this is real desert, a land beyond time, an unbounded void reaching from horizon to horizon. We dropped our tyre pressures to increase flotation. We passed some picturesque rock formations, sculpturally eroded by sun, wind and time. We reached Bir Salama, an abandoned pumping station and continued south eastwards. The temperature is now 95° Farenheit. We climbed many long ridges and descended some alarmingly steep dunes. In the afternoon we hit a large area of soft sand and frequently had all three cars stuck at once. We used straps, towropes and sand ladders, waffle boards and old fashioned push-and-shove. By evening we were all much fatigued and ready to stop. We found a wonderful site in the dunes and built a fire.At nightfall everyone sang 'Happy birthday to Kit' and I was presented with one of the group's last Mars bars! We left camp early and drove into progressively worsening sand. We made some amazing dune descents and crossed some beautiful desert landscape. By mid morning we were driving down a dune corridor, flanked by great dunes on either side. Many times we broke through the crust and sank up to the wheel arches in powder-soft sand. By noon we left the reaches of the sand sea and set off over a flat plain and cruised across the unmarked border into Egypt. This led us to our primary destination 'Big Cairn'. We arrived at lunch time and basked in the memory of this historic place. We all felt chuffed, three thousand miles from UK. This is the place where the LRDG left friendly territory and entered enemy held terrain. We lined up our Land Rovers for a photograph and later we left to drive west, following the LRDG's route. We camped in a great flat sandy plain just near the crash site of ‘Lady be Good’ a war time US liberator aircraft. We were driving west across the plain following the route of the LRDG after they left Big Cairn. The cairn was used as a survey point built by Major Clayton in 1934. In this otherwise featureless desert it was a good location for LRDG’s fuel dump on the 1941 Murzuq raid. It must be one of the most historical stone cairns in the Sahara. Many LRDG and SAS units rendezvous-ed here, and it was a powerful experience to tread the ground of history. We saluted brother soldiers and played the wartime favourite 'Lily Marlene' on the radio as we left. The plain ended and we encountered the southern reaches of the Kalansho Sand Sea. In the jumble of cross-directional dunes interspersed with stony outcrops it was a difficult drive. Our speed varied between 50 mph and 15mph depending on terrain. We were able to drive along the smooth crest of long whale-backed dunes and made good progress until the next slow, stony area. We crossed the Kufhra road in late afternoon, the first sign of inhabitation for 1,000 km. Clumps of tamarisk trees announced the Bir Zeigen area where we camped. Nick Robinson – a rally driver of good, excellent and amazing classic cars. A quick learner, skilled driver and a fund of information and facts. In charge of medical supplies and first aid skills for the group. Raymond Bird - reliable, amiable, and a great navigator. Fuelled by industrial strength tea and accomplished map reading skills he is the group’s senior member and it’s strongest asset. Crispin Clay – confident driver, and warm personality, backed by good mechanical skills, entrusted with sourcing all self-recovery equipment, vehicle maintenance and equipment storage. Simon Montford – lively, active and much motivated. He is learning Arabic from our Touareg guide, playing Arabic poker with our gendarme. He may be seen bronzing himself on top of a moving Land Rover, or conducting film interviews en-route. Kit Constable Maxwell – solid research and planning skills derived from numerous desert travels, many of them alone. Lifelong Land Rover user, ex Scots Guards and French Para’s. Historical adviser to the group on LRDG skills, deployment and achievements. We practiced dune-driving skills before leaving camp and drove to Tsaibo, a small outpost town. We replenished fuel and water. This is our first supply since leaving Jagbub - five days and a thousand kilometres away. Difficult sandy drive out of the town and off across the plain. We reached the dune corridor, in the Ribiana Sand Sea . We found a picturesque dune site and camped for the night. Silence, space and eternity. Drove down our dune corridor and came to the great dry lake. The shore was covered with mussel, oyster and clam shells - an extraordinary feature in this waterless desert. We found, after some searching, the well preserved wreck of a 1930’s bi-plane which had crashed here. We took photos and examined every piece with interest. Long and difficult drive on blackened sand to the volcano at Waw Namus. This is an amazing site, lost in a vast tract of soft black sand is the volcanic crater, about 2km wide . We stopped and looked down at the great central core surrounded by three shimmering lakes bordered with lush green vegetation. The temperature has soared to 104.6° F ( over 40 °C) and both cars and passengers are feeling the strain. We camped later by sandy dunes in the cool of the evening. I sleep with my tent door open and awake before dawn. I then pack up the tent, go down to the Land Rover, fill up the kettle and fire up the burner. Raymond joins me and we take our place on our desert chairs – each next to a storage box which doubles as a dining table. Richard is next to get up, always chirpy, followed by Chris who appears out of his swagman’s sleeping tube and Simon from his 5-star camp bed. Nick appears at the first hint of breakfast. There is a rustle from the floor and Mamdu, our memorable Touareg guide emerges from under a ground sheet. We breakfast on coffee and strong tea with pâté and crispbread for Raymond and jam for me. After breakfast, Raymond holds a briefing on the day’s itinerary and we discuss special challenges, recommended tyre pressures and rendezvous points. We then carry out maintenance checks, pack up and move off around 08.30 hours. The Discovery with navigator and Touareg guide will lead, with the two Defenders second and third in order. At 11 o’clock we stop for elevenses and at 1 o’clock we stop for a two- hour break. I take out two jerry-cans and stand them in the sand, then I install the ‘Kitmax twin-top tuckbox’, open both lids and remove - mugs, tea, sugar, kettle, crockery, cutlery and soup, and all accessories for lunch. Then I assemble the large door-mounted parasol and we set out our chairs and storage boxes…… and prepare a lunch of soup, mackerel fillets, mayonnaise and local bread where available. Between 5pm and 6pm we find a camp site. This may be on a dune or under a group of palm trees or tucked in a maze of tamarisk mounds. Sometimes our camp is just a speck on a great boundless plain. We set up our tents and unpack our cars. We light a fire and prepare for dinner. Out comes the 'Kitmax twin-top tuckbox' again and tonight we will have dehydrated soya mince. I add generous portions of red peppers, carrots, potatoes and onions, all bought in local stalls en- route. We awoke early and returned to the volcano for dawn pictures. Very beautiful. Back to camp site at 09.00 for vehicle maintenance. We left camp at 14.00 hrs for a long uncomfortable drive west. Turned off the main piste eventually and camped in a wide plain dotted with patches of soft sand, bordered with white lime stone. We were now three weeks into our desert dash and looking much like a troop of brigands. Richard has a big brindle beard, Crispin and Simon have one too. Nick looks like the chief brigand in his Touareg head-dress, and my hair has not seen a brush from day one. We cross a huge sand plain, part of the Murzuq Sand Sea. The Land Rovers could be seen shimmering in their own mirage. With no clear boundary the horizon was lost in a distance haze where land meets the sky. Arrived at Tmissa, re-fuelled and turned West for the final run to Murzuq. We camped in another picture book dune valley and we all sang Lili Marlene after a candle-lit dinner. Suddenly we reached Murzuq…….. We drove through the town, an old Saharan trading post and an important slave route in the 17th Century. We made a triumphant entry in our imposing desert-dressed Land Rovers, singing 'Rule Britannia' and 'Land of Hope and Glory'. The locals could only gasp in amazement. They have seen so many invaders in their history, from the Romans to the Italians, the Germans to the British. We rounded a corner and there stood the old Sultan's Fort, just as it did when the LRDG arrived all those years ago. It was a grand, imposing desert building, complete with guard room, inner courtyard and crenulated ramparts. It stood on a slight rise overlooking the town. This was our journey’s end and our rendezvous point. The modern Italian military fort nearby was the LRDG’s primary target, and it fell to Captain Michael Crichton-Stuart and the Guards Patrol to subdue it, while Major Pat Clayton raced off to the adjacent air field and disabled the aeroplanes, bombs, arms and fuel depot. The defenders were far from ready but rallied with commendable speed. The 15 trucks of the Guards patrol had to employ skilled fieldcraft to gain an offensive position without compromising their safety. I had planned this day for 5 years... and now it was here. We drove into the spacious courtyard of the old fort with many emotions; the joy of achieving our long sought goal, and reserve that our expedition was nearing its conclusion. We lined up the three Land Rovers in front of the main entrance, posed for photographs, shook hands and celebrated our great journey. We saluted absent friends of the LRDG, waved our Union Jack flags and moved off to the old airfield where we found a bullet-scarred hangar inhabited by wild dogs. What a great achievement that LRDG raid had been, over a thousand miles behind enemy lines, 30 trucks navigated over the most inhospitable terrain on the planet. Now, 65 years later, we had re-run the journey. We used the time-proved Land Rovers to meet the challenge together with satellite navigation and imagery to navigate by. We still had a very long way to travel and the journey included many tough dune crossings. The crest of a dune is a challenging obstacle which demands sympathetic treatment; it comes to a sharp peak on the windward side before dropping away suddenly and sharply on the soft leeward side. We try to perch on the crest, slightly nose-down, for long enough to plan an orderly descent. But this skill is hard won, and we frequently stall, half way up the crest, deeply embedded in the sand, unable to proceed or reverse. Once on the crest, we may become bellied down on an unforgiving myriad of sand particles, with no wheel-contact front or back. After the excitement of yesterday’s arrival at Murzuq our camp site at Camp Africa nearby was both welcome and timely and we spent the rest of the day washing our clothes, refitting and repacking for the journey ahead. We left camp and drove up to some mountainous dunes using every ounce of power and traction available. This is a steep, soft and difficult drive and after a few sandy extractions we were high on the dune plateau. We stopped on a ridge and far below was a picture book oasis, Lake Mandara. The water was a deep blue, fringed with rushes and palm trees and completely surrounded on all sides by huge sand dunes. This is one of several lakes in this area isolated by time and accessibility. We then visited the 2000-year-old Garamantes town at Germa and camped in the dunes later. We fuelled up the cars for a long desert crossing, over 800 km of rock and sand skirting round the edge of the Awbari Sand Sea. We allowed 25% extra fuel and 5 days supply of water. We made good time on the road, and it was very hot and I used the air conditioning in the last town. We entered the sand sea at 4pm and encountered several herds of camel with their drivers, returning to camp in the setting sun against the background of wind sculpted dunes. A scene unchanged for centuries. Memories are made of this………..
A sudden deep hole caused a sickening crunch as the Discovery’s well-laden suspension hit the bump-stop hard, the jolt also broke the fixing on my roof rack. The suspension survived. Crispin and I repaired the fixing later with bolts, nuts, clamps, ingenuity and imagination. We followed a beautiful sand track to an outcrop of small palms and scattered bushes and dust. Camped in a shallow sand valley bordering the Sand Sea. We reached Derj in the late afternoon, well on schedule. We continued to Ghadames where we visited the old town. 15,000 people lived in this rabbit-warren edifice which was served by a good well and sported many gardens and date palms - which supplied a living for the occupants. We dropped off Mamdu, our excellent Touareg guide who had accompanied us for the whole route. His knowledge of sand, dunes and desert terrain was unfathomable. Later we camped on soft dunes. Tomorrow we drive north and in a few days will reach Tunisia. A few days later we will take the Mediterranean crossing to Europe. This has been a tremendously successful expedition and many thanks go to the many suppliers, advisers, and well-wishers who supported us on our trip.